Are you ready to start making your own professional quality heat pressed shirts at TechShop? In this hands-on class, you'll learn all the basics of using our heat press to add your own graphic designs to shirts, blankets, flags, bags and more! Learn to use the computer-controlled (CNC) vinyl cutter and heat press in this Safety and Basic Use (SBU) class. Import vector (outline) designs from graphic software such as CorelDRAW or Adobe Illustrator into FlexiStarter, the software used to control the vinyl cutter. Next, use the CNC vinyl cutter to cut an adhesive vinyl sheet into professional looking signage or ready-to-apply paint masking as well as heat transfer vinyl for heat pressed shirts. 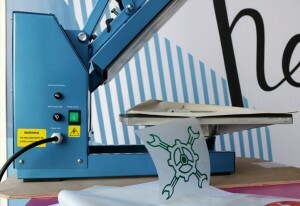 This is a great tool for making screens for silkscreen printing, too! Understanding of vector-based graphics is recommended. We recommend taking COM207 CorelDRAW for CNC. See our Minors & Shop Access Policies for more information.